Chuck, so you're saying you want to drive 7 days/ 365? The way i look at the 34 reset, is when before i drove i worked at a place that offered their employees four (ten hour days) instead of five (8 hour days) and almost everyone took the four day with week, as did i. If you're primary reason is to make money and get rich in trucking i think you're in the wrong profession. That's my opinion at least. I have personally spun this web every way possible, and the bottom line comes to this... if you run 10+ hours a day consistently, and sit it out doing a reset, are you available to go pick up a load during a reset? Can you legally drive anywhere to position yourself for a load during that reset? If your driver manager calls and tells you he has a load for you a couple of hours away from where you are, but you are doing a reset, can you tell him you can head that way to be ready for the load? People have responded to my post that I am wrong giving advice that I am about to give again on HOS. if you want to make money and work everyday you are away from home ... don't work more then 8 to 9 hours on line 3 and 4 on any given day. I would see if you can use personal conveyance time to go do laundry, shower, get food, etc. That's what it's for and that time is all off duty so it won't mess with your reset. I'm a little confused. You're going 620 miles on your trip. Did they give you enough time for a 10 hour break? If not then you just go with it, nothing you can do. If there is time for a 10 hour break i would have tried to go through atl at around 1 or 2am. You lose so much time there. I would stop at a t/s before atl, and figured my clock out, split my break if i had to. Cutting it that close is too stressful for me, but hey, I'm old. Lol. That seems really high, but maybe it's because you're 25. Mine was 6k first year and I had 2 yrs of exp with an accident. You should have got insurance before you bought the truck. I don't even know how they let drive it off the lot without it. I use pro guard out of Inverness, Illinois. You can give them a try but they're probably just as high as everyone else. Make sure your trailer hand brake lever isn't stuck. Mine for stuck once and burned up the brakes. I never thought about giving the extra safety speech to females but one night I walked with a student to a truck stop and we cut behind the shop and it was dark and she made a comment that she would not have gone that way unless s someone was walking with her. So just the fact that it made her uneasy really opened my eyes about extra safety p precautions. I know they've heard it a million times but I still said it. Like what kind of a weapon? Firearms are prohibited by most of the carriers we work for (in this caseCRST) and the shippers & receivers we frequent. I've trained a mix of males and females and here's some advice I could give. Get there bucket/plastic bag ready for makeshift toilet. You always have to keep bathroom locations in mind because females can't just jump out of the truck and go behind the tractor. So, if you're going into big cities like Baltimore or Chicago where there's not a lot of truck stops make sure they're all set before you go into the city. Also, when they get up from their breaks be sure to be close to a bathroom. But it did that with males and females. I always had to give extra emphasis on safety like not walking in dark places, always have a weapon... That kind of stuff. I always showered everyday or every other day so hygiene was never an issue. The only thing I didn't like about training females is that my company would call them daily for 6 weeks making sure they felt safe and it just got annoying after a while. DOT "tricks" should be aware of? The only things I've heard about is dot measuring bridge law with a tape measure and fussing over trailer and lights. But every dot officer I've personally encountered has been very helpful and honestly just thankful I can speak and comprehend English, lol. I'm an o/o and I am totally for elds. I like them a lot. But like old school said, the implementation was horrible. 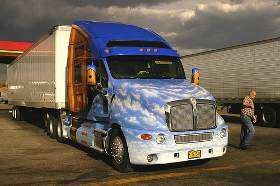 My first eld company lasted a year and went out of business. My second company doesn't have theirs programmed correctly. When I put myself in sleeper for 8 hours I get all my time back. I tried telling them, but talking to their customer service in India didn't do anything except confuse them. So I'm looking for a third company. Isn't regulation a good thing? Ok. We're all going to have to agree to disagree because I'm not going to argue on the internet. Honestly, I don't really care what raised rates. I didn't buy into the hype. With the extra money I made I paid off my truck and lowered my operating expenses by 50 percent and saved a good chunk. Here is an article where the ATA says there's 3.5 million truckers. Not sure what year this was written. What I meant was available drive hours was lost. A lot of it. And because supply and demand that's what mainly drove rates up. Secondly, listening to " experts," and "industry leaders" is very toxic. At the height of the rates they were saying the high rates were here to stay. You can make tons of money for the foreseeable future..Blah blah blah. Then a downturn came and all I hear is nothing from these experts again. All I see now are people that bought into the talk and now in financial distress. You don't think millions of truck drivers’ available hours being cut by electric logs has anything to do with rates rising? Ever heard of supply and demand? Lower the available hours, the higher the demand for them. I believe that some freight was front loaded. But to say that enough freight was front loaded that lasted through the retail holiday season is crazy. Where did they store all this freight? The warehouses are all the same sizes as the year before. Freight is fairly consistent meaning trips go 2 to 3 times a week for 8 months for example. You don't haul 200 truck loads in a month and then haul nothing for the rest of the year unless you're talking seasonal things like produce. You are correct. When the eld mandate went into effect, the rates nearly doubled overnight. It stayed very high for about seven months. People saw how much money they could make and there were record numbers of new startups, expanded fleets, and new equipment ordered. With the huge number of people in the industry it drove the rates back down and with how fragile the market is, the rates got really low. We didn't even get a Christmas uptick this year. The rates stayed very flat. Prepare to have a lot of places going out of business. There's not really a lot of people striking. They're the vocal minority that the media keeps on covering. David, you will need a minimum of 2 years experience to be insured by anyone. 4 years recommended. No matter how easy it may seem to book loads, the insurance companies rule the industry. It's California. You probably need a log book to go out and check your mail. For the trainers: Did I Cross a Line? When i was a trainer i would discuss eating on the road and health. The trucks didn't come with any inverters or fridges so it was a real issue. I probably wouldn't have said anything about the diabetes since i don't know much about it other than some basic knowledge. But i know where you're coming from because i had one student that just snacked for a week and i said something about eating mainly because i didn't want him to run out of energy driving while i was sleeping in the back. You will probably want to go to a starter company since you haven't been driving for so long. There's a lot of places that will let you have a cat. You'll just have to ask the recruiter about it. Good luck. I took my class a in Illinois, i forgot which center but it was down by kankakee. For the pretrip they want you to say specific things that are in the back of the Illinois cdl manual so make sure you know everything there. Then there was the air leakage test inside the cab. That's for class a, not sure for class b. Like old school said, it is an all in career. Unfortunately driving a truck is not a weekend hustle for extra income. I would recommend calling up some driving schools and seeing what kind of opportunities in your area if you do decide to make a switch.